Funding your online casino account is what differentiates free play from real money gambling. Reputable online gambling sites will feature multiple transaction methods for both deposits and withdrawals that are specific to various regions, including the Philippines. Philippines online deposit methods include a variety of options for funding online casino entertainment. Sites need to provide accommodations for all players in adherence with local Philippines gambling laws, policies enforced by banks and other financial institutions and more. Deposit and withdrawal methods typically vary depending on which Philippines online casino you are using, but most brands will feature several options. Multiple currency forms are accepted at many of these funding methods, including the Philippine peso, and there are often currency exchange services available. Filipino players not interested in using pesos can elect to fund their accounts using USD, euros, etc. This information also applies to legal Philippines mobile casinos. There are minimum and maximum deposit/withdrawal limits associated with each method. Additional fees may vary (commonly applied to withdrawals) and processing times could shift depending on the method you choose. This page has information on the most common types of deposit/withdrawal methods offered in Philippine-friendly online casinos. Most of the deposit methods you see discussed on this page are also applicable at Legal Philippines online poker sites and Legal Philippines online sportsbooks. Credit and debit cards are often the first option for many players due to their convenience and accessibility. Minimum deposit limits are usually lower for credit cards and debit cards. The most commonly accepted brands are Visa, MasterCard (MaestroCard) and American Express. There can sometimes be a low percentage fee attached to credit card or debit card deposits, but these are often waived for the first deposit (and possible subsequent deposits), but this is up to the operator's discretion. Deposited funds should be available shortly after completing the deposit. Additional documentation, such as your driver’s license (or other form of ID), credit card statement, etc., may be required before being eligible to use your card. This is a cautionary step taken to validate your identity and protect your financial/personal information. e-Wallets are an example of more technologically driven deposit method. They provide a peer-to-peer digital wallet service accessible through your computer or mobile device. You can send and receive money easily in multiple currency forms (including Filipino pesos). Players can get a more anonymous online gambling experience via digital wallets since you are not required to enter in any personal information. Cryptocurrencies are the up-and-coming frontrunner for preferred transaction methods with online gambling sites. Digital currencies, as they are also known, are unregulated currency forms developed exclusively for online use. Bitcoin, Litecoin, Dash, and Ethereum are the 4 most common types used. You can purchase digital currencies through online services such as Coinbase or through individual vendors. Cryptocurrencies have grown increasingly popular because there are no additional fees tacked on to transactions and they feature the fastest processing times out of all the available methods. There are even bonuses exclusive to cryptocurrency users. If you are looking to receive the full amount of your winnings in the shortest amount of time, consider using cryptocurrencies. Digital currency transactions are also anonymous in nature because all you need to enter in the gambling site’s digital wallet address. No personal information is required to make the transaction. Cryptocurrencies are available on some of our recommended brands, but Filipino players have more luck with other deposit methods across a wider scale. Wire transfers are a bit archaic to use in today’s online gambling landscape, but a lot of sites still offer them as viable transaction methods. People tend to use wire transfers more for withdrawals, but players can make deposits with them as well. Wire transfers are beneficial in that you can make a deposit without attaching any personal banking information. You only need to enter in banking information if making a withdrawal. However, wire transfers are limiting in that they have some of the longest processing times around and incur high percentage fees per transaction. Another popular deposit route are prepaid options. Players can load money onto a prepaid card and then use it like a debit card when making deposits. This method is helpful because it allows players to only gamble with what is loaded on the card, whereas credit cards allow for unrestricted play. 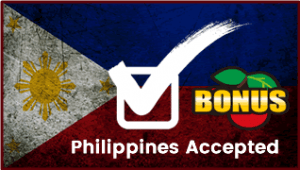 ecoPayz is an example of a prepaid option available to Filipino gamblers. Prepaid cards are available in multiple currency forms, including pesos. Sometimes they fall under the title of international gift cards, such as MST Gift Cards, which are available for worldwide use. Funding options – Can top up using a credit/debit card (subject to transaction fees), bank account, alternative currencies, etc. Money orders can be purchased at local retailers and mailed to the designated address found in the casino cashier or banking suite. If you have any questions about where to send the money order, you can contact customer support at the online casino at which you are depositing funds. Obviously this funding method takes some time due to having to mail the money order, but is a reliable option for those who are not interested in any of the online payment methods. It is easy to see why the allure of cryptocurrencies extends to withdrawals. Players do not have to risk losing some of their winnings due to processing fees issued from the online gambling site or a backing financial institution. Players will be able to receive their winnings almost instantaneously after requesting the payout. Digital currency transactions are inherently secure through the digital wallets that store them coupled with the data encryption of online gambling sites. The same arguments for why e-Wallets are good for deposits can be made for withdrawals. They allow for anonymity and speedy transactions without entering in your credit/debit/banking information into the online gambling site. You can receive money as easy you can send it. There are low percentage fees applied to e-Wallet withdrawals. Skrill and Neteller are the 2 most common digital wallet service providers. Another available method is paper cheques via a courier service. This method may seem dated, but it is still offered for players without digital means. The downside to paper cheques is that they take a long time to send (could be weeks) and there are deductions to your winnings thanks to additional fees. This is why many players have begun using digital services. All of the Philippine online gambling operators that we recommend are safe when it comes to financial transactions. Each transaction method has its own inherent security features (i.e. fraud protection), but there is no such thing as too much security. Reputable online casino brands provide data bit encryption and SSL (Secure Sockets Layer) protection to safeguard all personal and financial information. For those who would like to disclose as little personal information as possible, there are financial methods that suit your desire.